Jazz pianist Brad Mehldau takes the stage solo in south France, where all of his talents are laid bare for all to see and hear. Brad Mehldau once used an album's liner notes to ponder how the similarities that critics have drawn between him and Bill Evans were a little on the uninformed side. You can't really blame his defensiveness since it seems awfully narrow-minded to single him out as a Bill Evans wannabe simply because he's a jazz pianist who happened to record more than one live album at the Village Vanguard with his trio. To more discerning ears, Mehldau has become something of a Keith Jarrett for the X generation. While tackling old jazz standards with drums and double-bass is all well and good, going after more contemporary tunes is better. Better still are solo concert performances where inhibitions disappear and the music can flow in accordance to its own will. That's what's going on within the new 2 CD/1 DVD package Live in Marciac. These 100 minutes of pure uninterrupted piano virtuosity were captured at a 2006 performance (why are so many live jazz albums released so long after the actual performance has occurred?) at the famous Jazz in Marciac festival, located in the south of France. By mixing a handful of originals into a set mostly consisting of covers, Brad Mehldau is able to show off the full scope of his sickening talents. The opening pair of "Storm" and Cole Porter's "It's All Right with Me" showcase enormous hand-leaps and rapid-fire ostinatos setting the stage for frighteningly accurate spider-work over the keys. After that all settles (with Mehldau removing his jacket, no less), the man sits back down and reminds everyone that he is armed with a palpable sense of taste on "Secret Love". With the exception of some off-setting note stutters likely meant to intensify the introductory passage, it is cocktails in the springtime. This is one of those albums where, prior to hearing it, you may not have been aware of how much control Mehldau has over his instrument. He can make it sing, yawn one moment and totally chop it into pieces the next. "Trailer Park Ghost" in particular, a number from his excellent solo jazz/classical mash-up Elegiac Cycle, can get the listener dizzy with its intermittent Monkisms disguised in the flourishes. The dexterity he employs to the opening of "Unrequited" is either inspiring or discouraging, depending on how jealous of a musician you are. Seriously, for a few bars, he only uses his left hand. Mehldau has always been good for a few oddball covers, namely Radiohead tunes. He reprises "Exit Music (For a Film)" on Live in Marciac, but it is Nirvana's "Lithium" that stands out more. Mehldau's playful approach to skewing the harmony that accompanies the melody goes a long way in deconstructing the tune while still keeping it recognizable. The same can be said for "Martha My Dear", one of his two Beatles covers from 2005's Day Is Done. The melody remains untouched, but so many surrounding elements give the song a strange new life. How many other Beatles covers get manipulated so successfully? Live in Marciac is an overall classy package. The DVD may not be terribly exciting to people who needs lots of visual stimulation to go with a solo piano performance, but it captures Mehldau's easy-going stage presence through little-to-no effort at all. For some unknown reason, the DVD concludes with his slow, languid rendition of "My Favorite Things", while the album closes with a quick, lighthearted leap through Bobby Timmons' "Dat Dere". 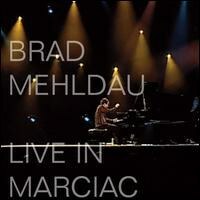 In 2004, Brad Mehldau released Live in Toyko through Nonesuch, and comparisons from one to the other are inevitable. The most glaring difference is the sound. Live in Marciac has a brighter, more trebly sound, while Live in Tokyo is somewhat bottom-heavy and muted. Whether it's a difference in microphones or microphone placement, I don't know. But a side-by-side comparison of Nick Drake's "Things Behind the Sun" from both albums gives you a pretty clear idea of how two different solo piano concerts from the same guy can sound different. Through his choice to cover the likes of Oasis and Soundgarden, his crossover endeavors into classical and pop-jazz territory, and all of those pesky Bill Evans comparisons, it's easy to forget that Brad Mehldau is a soulful interpreter and damn fine pianist. Top tier. If Live in Marciac doesn't convince you, I don't know what will.